This town, situated in the Province of Messina, 110 km away from Palermo and approximately 80 km from Messina, is only over two centuries old. Sant’ Agata di Militello is an entrance to Parco Regionale dei Nebrodi and, therefore it has become a well-liked holiday destination, whose population reaches 13,006 inhabitants. Its neighbouring towns are Acquedolci, Militello Rosmarino, San Fratello and Torrenova from which travellers derive pleasure for the many natural and historical beauties they offer. Missing Parco dei Nebrodi would be unforgivable. The park created to preserve forest of yews, oaks ashes among many others and the wild animals which shelter in the forests is a magnificent experience for a family to live and relive. Throughout the summer season the town is peopled by Italian holidaymakers drawn by its span of inviting beaches (Picture 3) and wishing to make the most of everything in the region. 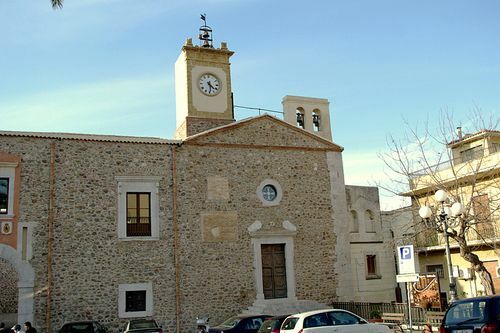 In the centre of the town Chiesa del Carmelo deserves a visit. It houses a precious 18th century gable. The Museo Etno-Antropologico dei Nebrodi offers besides its collection, maps and information about the region. BY BUS: from Catania (length: 2 ¼ hours, services: 1 a day, Monday-Saturday ). A daily bus service runs from Catania to Sant‘ Agata di Militello ( a gateway town to Parco die Nebrodi). calling at Portella Femmina Morta where you can join the lake circuit walk. BY CAR: The SS 259 crosses the park from Sant’Agata di Militello to Cesarò. BY TRAIN: from Milazzo (length: 1 ¼ hours).